Hey everyone! This is PolymomoTea and for today’s video I have a how to make/diy/craft/sculpt this cute/kawaii little musical instrument electric guitar tutorial made out of polymer clay and resin. Resin: a compound that is time curing into a hardened plastic material. I used UV resin, but you may also use 2 Part resin. Link to UV resin here: http://bit.ly/2j9mnn8 and look up “UV resin”. UV resin requires curing in direct sunlight or under a UV lamp, I use a UV lamp used for nails/nail art. The mold maker I used is called SortaClear. But at the craft hobby store, there should be many varieties of mold putty that should work as well! However, unless the mold is clear, you cannot use UV resin. But 2 part resin should work just well. 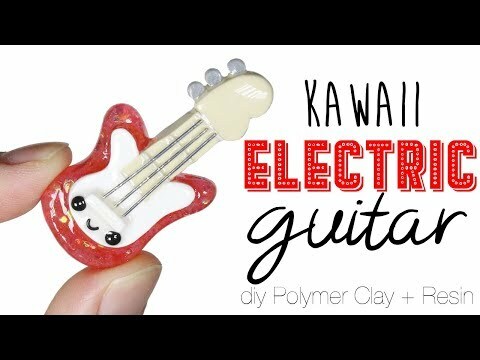 "How to DIY Kawaii/cute Electric Guitar Polymer Clay + Resin Tutorial vous a satisfait ?"